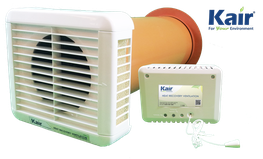 Want personalised Combined Heating / Ventilation Systems recommendations, direct from manufacturers? Search 5 Combined Heating/Ventilation Systems from leading Air Conditioning & Ventilation manufacturers including; AmbiRad, Advanced Air (UK) Ltd and FG Eurofred Ltd.
You can see a full list of manufacturers of Combined Heating/Ventilation Systems here. Important criteria to consider when specifying Combined Heating/Ventilation Systems include; Max Height, Height and Max Width.